Portable and Lightweight: small and exquisite camcorder,easy to carry around and store,perfect to be a gift and record every joyful moment for your kids, family,friends party and travelling. It's also perfect to take some short films or videos to record your daily life. Secure every memorable moment in your life: record important events : like a wedding to be recorded under a variety of situations,capture and share every precious moment of your baby's development; ideal for formal ceremonies, animals in the wild, fun family times, travel memories and more. LED fill light, white balance and light exposure settings adjust the light of pictures and make sure you can record high quality clear pictures and videos even on dark nights. Big storage: up to 32GB, supports for SDHC class 6 and SD/MMC Card slot ( SD card is not included); With equipped AV and USB cable the camcorder can be connected to your TV/Computer/PC for easy file transfer/charge. The storage card is better to be Class 6 SD card. This camera is very versatile and easy to use for any angles with a rotating screen and a great camera to record athletic sporting events or musical, boat fishing, etc. 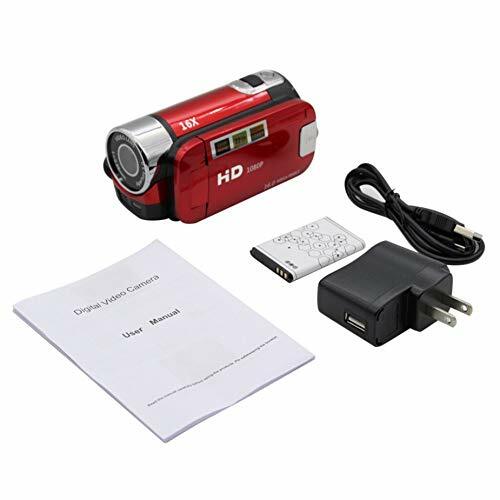 It's perfect for home and tourism video camcorder.